Two teams were officially relegated from the Premier Division, while the First Division League title will be decided on the Final Day of Football. The Southampton Rangers remain on top of the Standings by one point as they defeated Young Men Social Clun 6 – 1 at the Southampton Oval. Substitute Jarazhino Bassett would find the back of the net twice for the home team, while Nicholas Mello, Cardel Henry, Ezekiel Stoneham and an own goal all resulted in the six and Nique Armstrong scored the lone goal for Young Men Social Club. At the BAA Field, Flanagan’s Onions would defeat Wolves 4 – 0, Mikale Williams scored twice for the Flanagan’s Onions, who also got goals from Seth Odondi and Treshun Smith. At Lord’s in St. David’s, host St. David’s and neighbors St. George’s Colts played to a 1 – 1 draw. Kamali Davis gave St. David’s the lead in the 12th minute, but Sage Paynter equalized for the St. George’s Colts in the 27th minute. At the White Hill Field, the Somerset Eagles have set up a winner take the title match up on the final day of the season when they will face the Southampton Rangers after they defeated a resurging Vasco 2 – 1. Leo Burgess would put the Somerset Eagles ahead in the 44th minute, Ricardo Ponte would draw Vasco level with a goal in the 59th minute, but Anwar Telford would score what proved to be the winner in the 65th minute. The Somerset Trojans were officially relegated to the First Division following their 2 – 1 defeat at the hands of the Boulevard Blazers. Ernest Trott would give the Boulevard Blazers the lead in the 21st minute, Clay Darrell would double the lead when he scored in the 50th minute, but DeAndre Wainwright would give the Somerset Trojans a life line when he scored in the 64th minute, but Somerset could not find an equalizer. X-Road’s would travel to the Southampton Oval to face off against the Paget Lions, X-Road’s would defeat the Paget Lions 6-1 to send them back to the First Division. 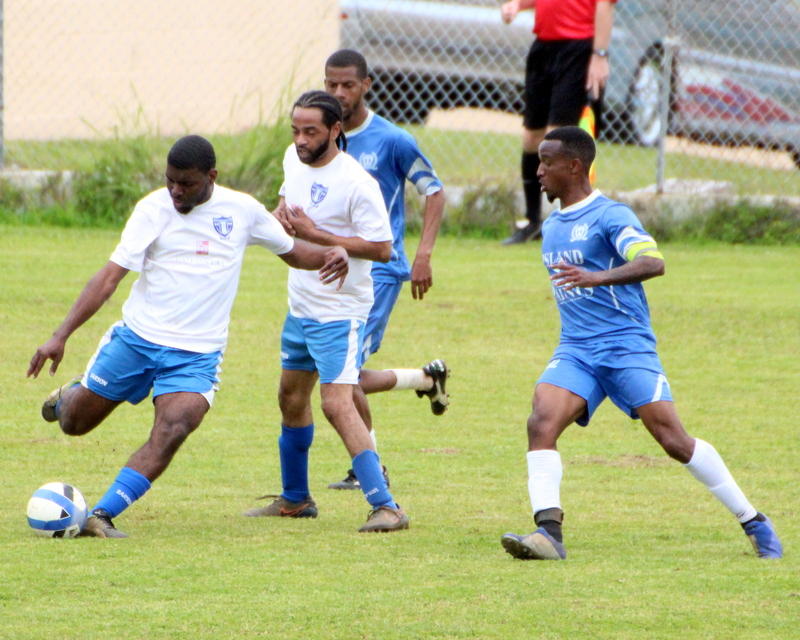 X-Road’s would be led to victory with double strikes from Paul Douglas and Donavan Thompson, while Tymon Daniels and Jorge Sanchez added a goal each, Chare Smith scored the lone goal for the Paget Lions. At the PHC Stadium, visitors Dandy town Hornets came away with a 2 – 0 win. Oneko Lowe gave the Dandy Town Hornets the lead in the third minute, and then in the 25th minute Jahnazae Swan doubled the lead. Neither team would find the back of the net for the remainder of the game as the visitors came away with the three points. At the Bernard’s Park, the Devonshire Cougars came from behind to defeat the North Village Rams 2 – 1. Keith Jennings gave the North Village Rams the lead in the 34th minute, but Allan Douglas would equalize with a goal for the Devonshire Cougars in the 75th minute and then in the 81st minute Chae Brangman would score the visitors winner.